Plants are integral to the biosphere, the part of the earth which is occupied by living things. They are fundamentally the beginning of complex life as we know it. No matter which ecosystem you look into, plants are inevitably going to be there. Terrestrial plants are perhaps the most common and the ones we know so well. However, there are also aerial plants and water plants. These plants have deeply integrated into their respective habitats. Water plants grow on bodies of water, commonly ponds and lakes. There are many kinds of water plants: there are those that are floating freely in water without holding to the soil, those that are freely floating on the surface, and those that are rooted to the soil under but have parts floating on the surface. No matter which one you will have, these water plants will definitely look awesome in your indoor water garden or outdoor pond! Water plants, also known in the trade as aquatic plants or hydrophytes, are plants that have adapted to grow in aquatic environments. Bodies of water and wetlands are flocked with these types of plants, and they have specialized parts that enable them to thrive at the water’s surface or submerged underwater. Some of them are quite particular with the water, whether it’s saltwater or freshwater. Some indoor gardening ideas involve a number of water plants. 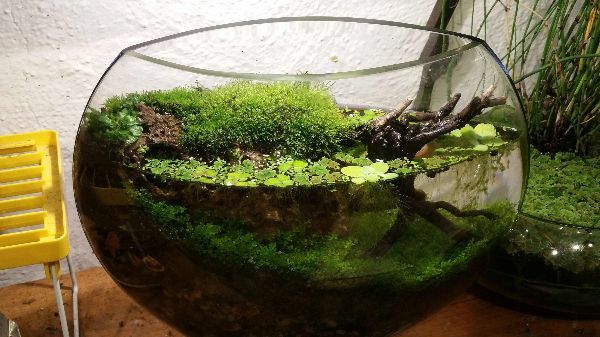 A famous one is the “jarrarium,” which is a sort of a small aquarium (usually a jar, hence the name) filled with a lot of water plants and fish or other aquatic critters. You can also try out making a more permanent pond on your backyard and fill it with water plants. 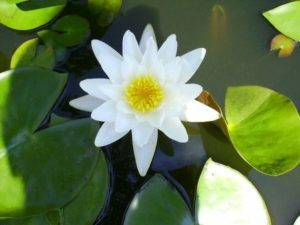 There are many types of pond plants, like the marginals, deep water plants, oxygenating plants, and the floating water plants. Having a mix of these will ensure your pond to be as healthy as it should be. In picking up water plants for your ponds, you will have to consider the size and amount of light you can provide to the plants. This is especially true for your indoor water gardens. 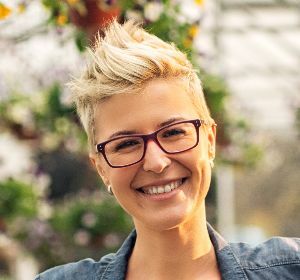 Don’t worry; we have rounded up some of the best water plants you can have so that you can grow your own water garden in no time at all! 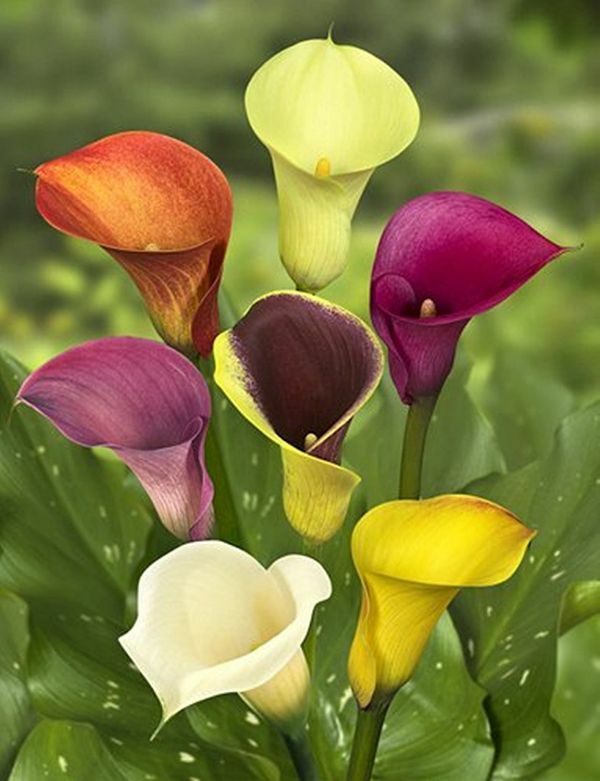 Despite their name, calla lilies are actually not lilies. These water plants are famous among gardeners for their beautiful foliage and sensual flowers, and they are also quite easy to take care of. White Callas are the ones known to be semi-aquatic, while the hybrid colored ones need drainage. The former can be fully submerged in water, while the latter is best placed where it only touches the top layer of water. 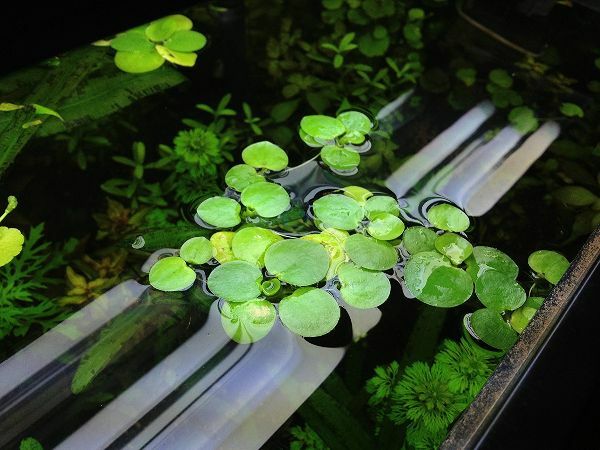 The Amazon frogbit is a popular choice of floating water plants for ponds and especially aquariums. They’re easy to take care of and they grow too quickly that if left unchecked, they can cover the surface fast, so you’ll need to be mindful to thinning them. Young ones have their leaves flat, while mature ones have emergent leaves above the water. Keep the top of the plant dry or else it will rot. 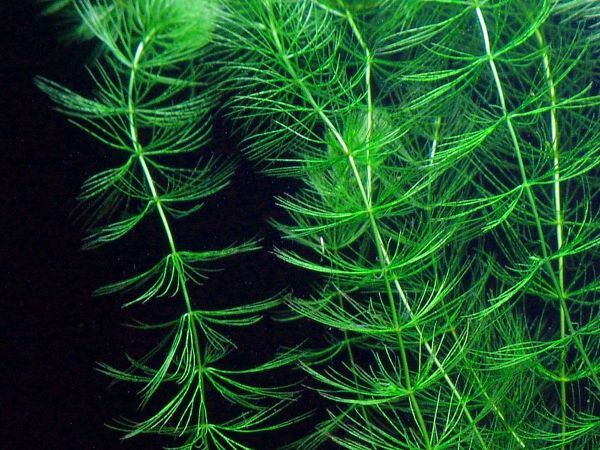 The parrot’s feather plant grows underwater and can grow up to a foot above the water. Their feathery foliage is extremely attractive, making them a great addition to your water feature. However, these water plants are considered an invasive species because they can grow fast and immediately fill their habitat. You need to check up on them every now and then in your ponds so that they don’t overwhelm your other plants. 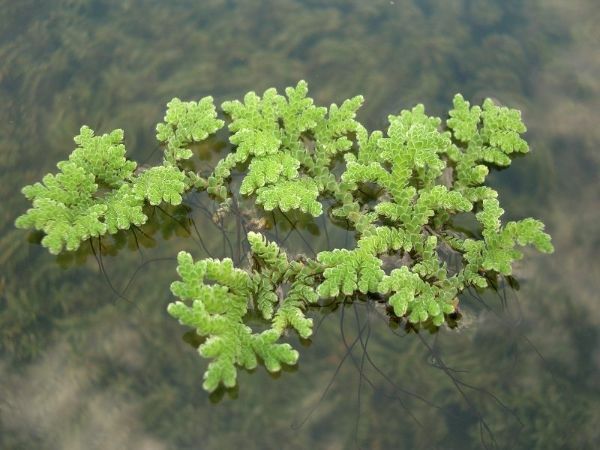 Looking like the duckweed, the Azolla is a highly productive plant, and can easily cover entire bodies of water with its tiny and water-repellent leaves in a matter of days. They got their common name because they can repel mosquitoes from laying eggs due to their matting nature. They are sometimes used as fish food, and we recommend putting these water plants only if you have fish in your ponds or aquarium, as they can help curb their fast speed of growing. Hornworts are excellent oxygenating water plants, and several fishes benefit from having these water plants in their ponds and aquariums. A rootless plant with thin leaves, hornworts serve as breeding grounds for koi fish while goldfish enjoy eating these leaves. These water plants are also known to release certain chemicals that inhibit pond algae growth, making them a prime addition to any pond. 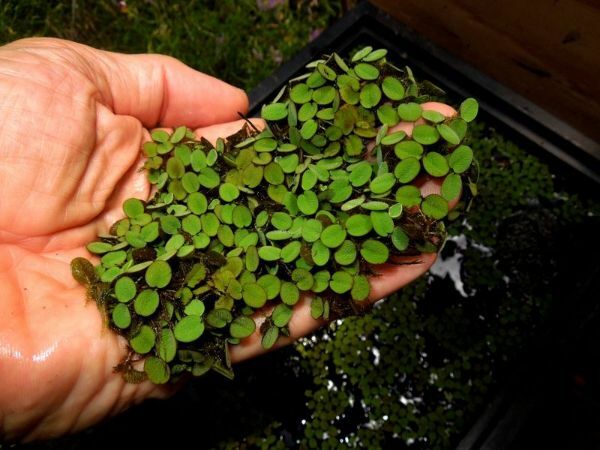 Being one of the smallest aquatic plants in the world, duckweeds are tiny floating water plants harvested around as animal food; cattle, swine, chickens, ducks, rabbits, goats, and fish are known to eat these tiny water plants. The duckweed is also used to regulate nutrient levels and algae in the water. 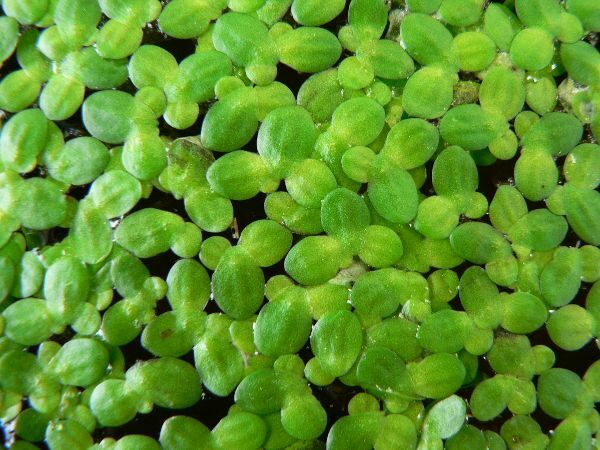 One kind of duckweed, the Wolffia globosa or the Asian watermeal has the smallest flower of any plant around the world. 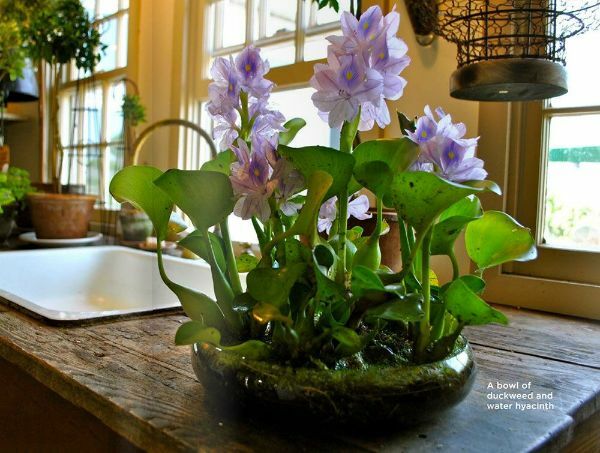 The water hyacinths are beautiful water plants which grow fast once established, so fast that it has an extensive history of choking out waters in several countries, including the United States, New Zealand, and Europe. Each plant can hold as many as 20 flowers, making them excellent additions to your indoor garden. Keeping them under control is one of your priorities in having this but it’s in exchange for a pretty plant that’s easy to grow. Another invasive species in the list, the water spangles undergo three stages of growth, and at the end of this, it will have grown into a mat in the surface of bodies of water. It’s commonly used in aquariums to provide shade for fishes and help ward off algae blooms. 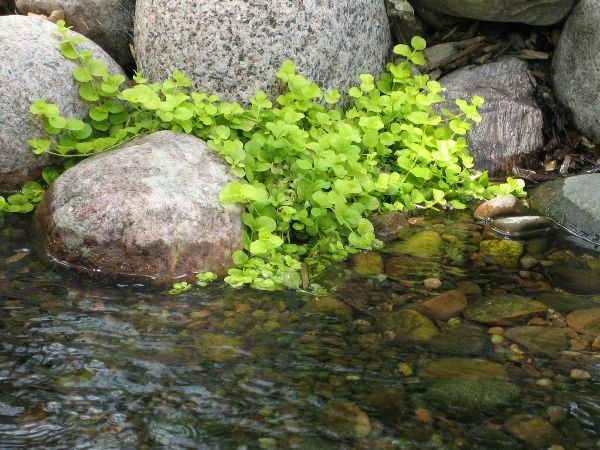 As with other invasive water plants in this list, it grows exceptionally well once established, and you will need to control their growth every now and then. Creeping Jenny plants are famous as ground covers and were used in herbalism for treating wounds in the old times. It looks great in the sides of outdoor ponds, where they can grow in between rocks. They grow their cup-shaped flowers in summer, adding a colorful pop to your pond. These water plants are also invasive species, so you will have to cut them down when they spread a little outside their area. 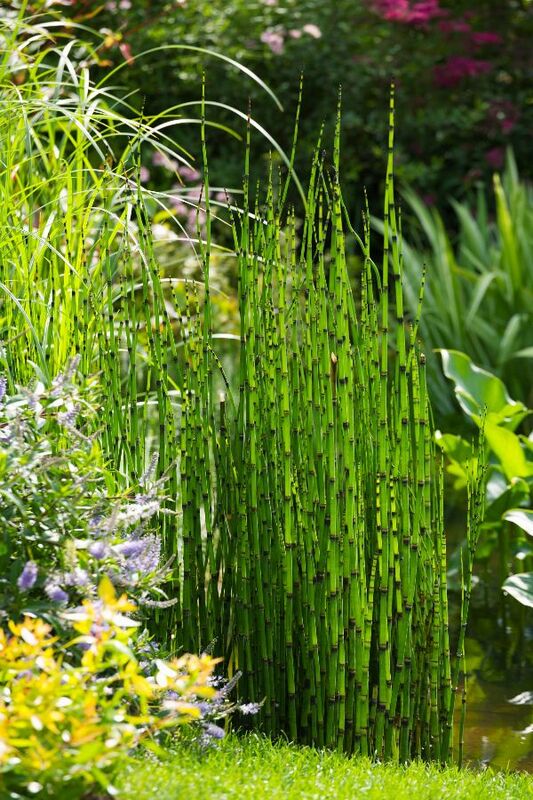 The rough horsetail is great for adding a vertical presence to your outdoor ponds. These water plants can grow up to three feet high, while dwarf varieties can grow to eight inches. Since they aggressively grow in water, you can plant them in a container before submerging them in your pond to help control their growth. Take note, too, that these plants are toxic to horses (despite the name) and cattle, so keep them away from your water plants if you have them. The water lotus is an exotic and eye-catching plant that will undoubtedly become the centerpiece of your ponds. Their flowers can spread to a foot wide and come in a variety of colors. They thrive well in bright light and can quickly take over a pond if not contained. Keep them in a container before submerging it 6 to 10 inches below the water surface. Make sure that you have enough space to let this big plant grow, too. The umbrella palm is sought after for their impressive height that can grow to six feet. 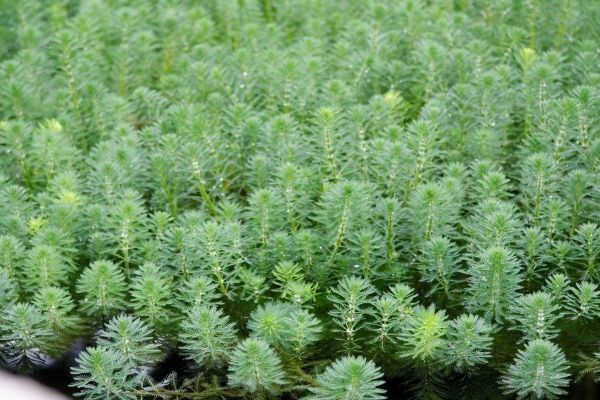 It creates a soft backdrop for shorter aquatic plants, but it can grow notoriously fast and spread if not put in a container. The common practice to help control it is to plant the palm in a plastic tub; you don’t need dirt because the plant mainly derives its nutrient from the pond water, but having soil can help establish the palm. You can cut the root-ball safely because it will easily grow back. 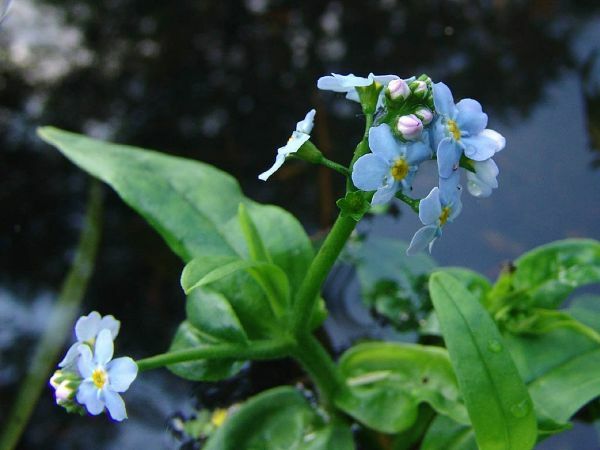 The water forget-me-not blooms beautiful blue or pink flowers in their dense mats of foliage. They are best planted in moving water like in waterfalls, where you can easily stick the stem cuttings in between rocks and they will eventually flourish. 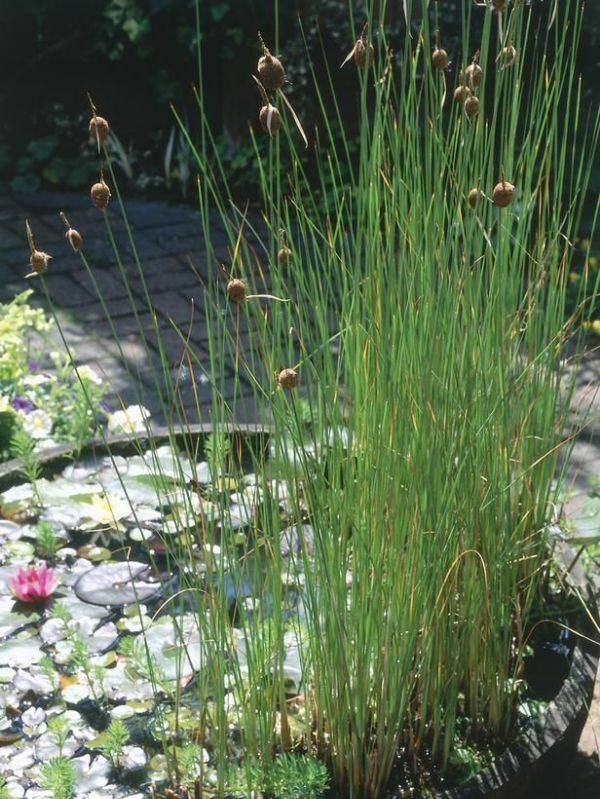 You can also plant them in the edges of the pond, as these water plants prefer shallow waters. The plant can grow up to 28 inches high, so you can encourage it to branch by pinching. 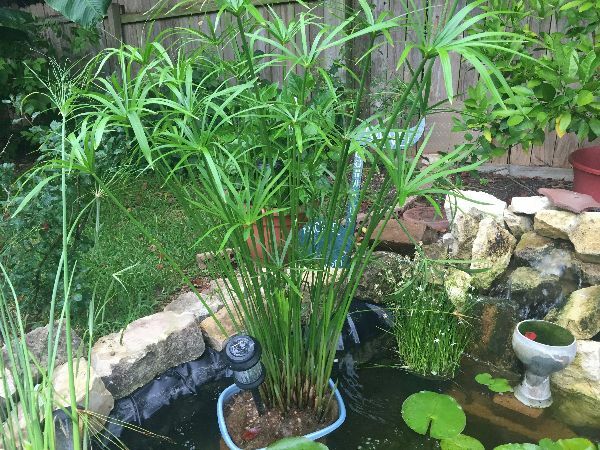 Another tall plant you can add to your outdoor pond is the cattail. These water plants are great for adding an architectural presence in your outdoor ponds, with their majestic height sprouting in the sides. As with most plants in this list, they can grow and reproduce notoriously fast, so you can contain them in a pot to help maintain them. Native varieties grow up to six feet tall, while dwarf ones stop at two to three feet. The mosaic flower is a floating plant named after its diamond-shaped leaves that form a mosaic. 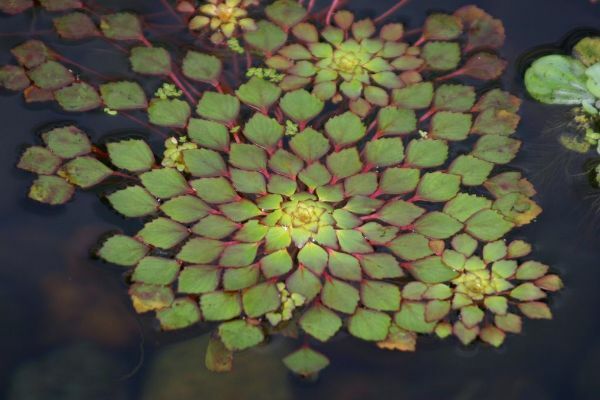 It grows reddish-green leaves in 3-6″ rosettes which can be an attractive texture in the surface of your ponds. Their yellow flowers bloom in the middle during summer. 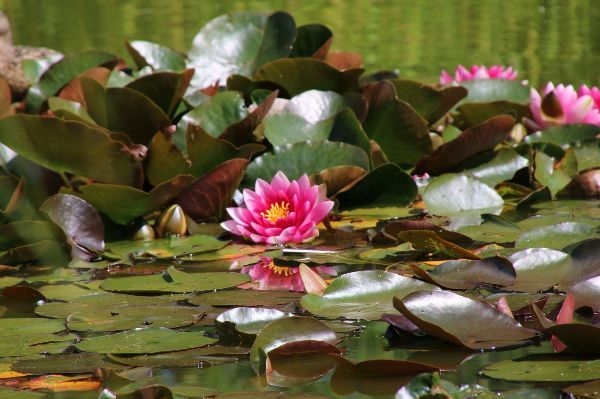 These water plants are great for providing shade in ponds with fishes. It grows well in warm waters with long hours of light. 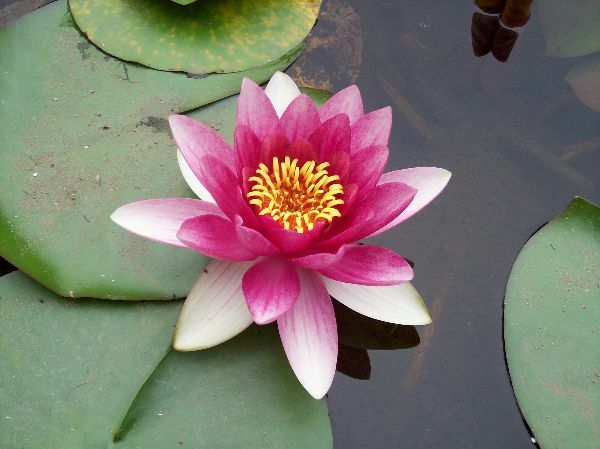 The water lily has striking similarities with the water lotus. Their most distinct difference is their leaves; the water lily’s leaves stay floating as lily pads, while the lotus leaves are well above and not touching the surface. The water lily and its beauty have been enchanting us since forever, and thankfully enough these water plants are fairly hardy, so they are perfect for beginners. You can also choose from day- and night-blooming varieties. Why add Water Plants to your home? Perhaps one of the greatest and most obvious benefits of having water plants inside your home is their beauty. 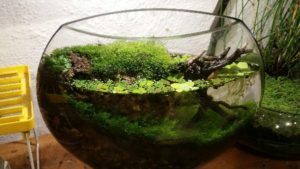 There are many ways to put water plants inside the house, whether you want a container water garden like a “jarrarium” or a more permanent indoor pond structure. However, no matter how you put them, they will positively add attractiveness to your space. The sight of greens is more than a welcome one, but adding water into the view makes for a more natural appeal. Aside from adding beauty, water plants are also great if you have an aquarium filled with fish. These plants can filter out waste from fishes, replicate natural habitat, and help aerate the aquarium. Water plants also give these fishes a sanctuary where they live and lay eggs. They are protected and can hide in the roots and features of these water plants. Your swimming critters will certainly appreciate a plant or two with them! Unless you live near a body of water, water plants are not something you see every day. In some instances, they bring us closer to nature, because they thrive in our very source of life that is water. Indeed, set-up and maintenance of water gardens and ponds are fussier and more of a hassle than land plants and aerial plants. However, beyond all that, the end product will certainly give a sense of calm and peace that only emerald greens among still waters can bring.